What has been rumored for weeks will become reality today at a 9:00 am press conference inside Salina’s Bicentennial Center: Indoor Football is coming to Salina. The City of Salina will accept a bid from a local ownership group that includes Junction City businessmen Chris Vercher and Jake Leighty as well as former Salina Central Mustang and Kansas Jayhawk, Jake Sharp. 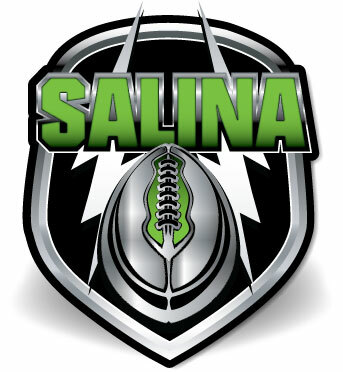 The group will enter into a five year lease with the City of Salina, and will field a team to compete in the newly formed Champions Professional Indoor Football League. 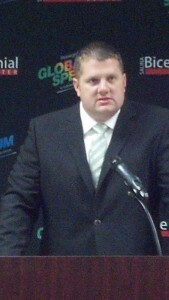 The CPIFL will feature approximately 10 teams, all with mid-west roots. While the CPIFL is a newborn, most of the member teams are not. Some of the franchises, including teams from Wichita, Topeka, Sioux City and Sedalia, have been in existence for over 12 years. 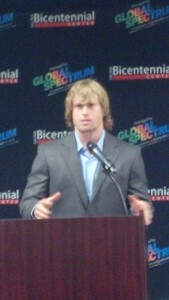 Owner Chris Vercher tells Salina Post, the league and especially this team will always have the fans in mind. “The blueprint for the CPIFL is fan-friendly football. The fans are a major part of the game and we want to give them a quality team to root for without breaking the bank.” According to Vercher, projected ticket costs will be as low as nine dollars for adults with half-price tickets for children 12 and under. There will also be special pricing for the “action seats” next to the wall that surrounds the field and V.I.P. seating will be available.